This film about coming out, being yourself, and small town life is one of my top five all time favorites. If Fruity Movies had an “official selection,” this would be one. 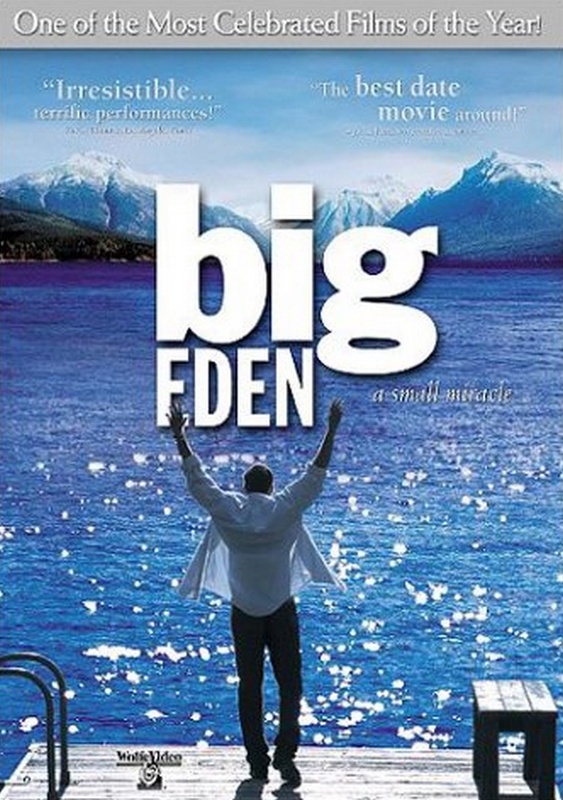 Big Eden is one of those movies that envelops you in it’s story, and says what it means with grace and finesse. My synopsis: Henry lives in the New York City now and is just about to have his own opening night. But back in his home town of Big Eden in Montana, his grandfather has had a stroke and Henry must go back to help take care of him. When he goes back he find that his childhood friend and crush, Dean, is still living there. The two still have feelings for each other, but there are complications. Meanwhile, another childhood friend, Pike, develops feelings for Henry which is a surprise for them both. This all plays out among the small town folks who live and care for each other in Big Eden. Henry still has strong feelings for Dean, and although we don’t know exactly what happened before Henry left we do know that there was an intense bond between the two. And when he goes back, it’s almost like he never left. He and Dean end up exploring what their new relationship is. It’s still not easy for Dean. While Dean knows he loves Henry, what form does that love take? Pike is such an interesting character. He seems like he’s a bit taken by surprise by his feelings for Henry. He’s not quite sure what’s going on with Henry and Dean, but he’s determined to show Henry that he cares for him and wants something more. And that’s one of the main issues here. One man wants more, and another may or may not. This theme carries through to Henry. He is a successful artist in NYC, but does he also want more out of life than what he has in NY? We don’t see a whole lot of what he gets out of life in the big city, but we do see all that a small town has to offer. He has neighbors and friends that are more like a big family than just acquaintances. It’s a double edged sword where everyone in town cares about you, but everyone knows everything as well. The movie moves along very well, but it also gives you the feeling of a small town. The pace of life is different. From scenes in the town school, general store, and town events there is a different approach that if you let yourself be drawn in you can almost feel your blood pressure drop. Another theme here is about being yourself. All of the main characters struggle with this, although the writer seems to have purposely made it so that they don’t face outward struggles. The townspeople are just fine. This movie is about internal struggles, and it put the focus on this theme very well. Henry, for some reason, still has not come out to his grandfather. One of the most touching scenes in any gay-themed film exists in this movie when Henry and his grandfather talk about shame. Dean wants to give Henry what he wants, but he struggles with whether or not he can. And Pike is taken aback by new feelings, and has to figure out if he wants to pursue this potential relationship. Big Eden is full of deep emotional commentary, but it also infuses humor. The townspeople provide comic relief keeping the film from becoming brooding or unfortunate. Some of the best lines come from the guys who practically live at the general store, and are helping Pike in his quests. I know this is not a recent film dating back to 2001, but so few few films have met its match since then. I highly recommend that you see this film as one of the best gay-themed films made.